Example: big doggy would find tweets that contain both “big” and “doggy”, but not necessarily the words paired together. Exact match queries: if you use quotes, you can limit tweet searches to exact matches. Example: “big doggy” would find tweets that contain the exact phrase “big doggy”. OR queries: if you are looking for two related or interchangable words, OR queries work well. Example: dog OR doggy would find tweets that contain either words. Example: #ff would find tweets that contain #ff (which stands for Follow Friday). At queries: when referencing someone on Twitter, you use @ (at reply), so it makes sense you can search for people doing so. Example: @webconnoisseur would find tweets reference me. Question queries: target tweets that ask a question. Example: web designer ? would most likely find tweets of people looking for web designers. Combining queries: You can combine queries to really nail down what you are looking for. Example: “seattle startup” OR “seattle start-up” OR “@seattle20” combines the simple search commands listed above and would be an excellent way to find tweets related to startups in Seattle. From and To queries: You can actually target tweets that are specifically sent to or from someone. Example: “from:GregBoser” “to:Graywolf” would show me tweets Greg Boser sent to Michael Gray. If you perform a query like this, Twitter will also include a link that will allow you to see the entire conversation, if there is one. Exclude queries: You can specify words you don’t want to see in your query. Example: hello -kitty would show me hello tweets, but exclude tweets that are reffering to hello kitty or someone saying hello to their kitty on twitter (trust me, you want to stay away from these people). Location queries: You can actually limit tweets by location. Note: it isn’t entirely accurate as it appears to go off the location the person has listed in their profile, which isn’t always where they are at the time. Date-based queries: You can actually limit tweets by date, both before (use “since:”) or after (use “until:”). Attitudinal queries: Some Twitter users incorporate happy or sad faces into their tweets. You can search these to find attitudes about topics. Example: cloudy with a chance of meatballs :) would show me people who were happy to go see or enjoyed the movie Cloudy With a Chance of Meatballs. Source queries: probably one of the least useful queries unless you want to research a 3rd party tool’s adoption, you can do query searches by tweet software source. Example: LOL source:tweetdeck would show me LOL tweets that came from someone using tweedeck. Link filtered queries: a great way to track down referenced links, this query will limit Twitter searches to tweets that contain links. Example: mashable filter:links would show me people’s tweets linking to Mashable articles. Jumping forward in older searches if you are hunting for something via Twitter search and want to save yourself from clicking “older” over and over, you can change the page number (after your first older click) in the Twitter URL to jump forward. Example: http://search.twitter.com/search?max_id=3984008800&page=2&q=fight&rpp=20 is the result I get after searching fight in search.twitter.com and clicking on older once. To jump further back in time and skip a bunch of tweets, I can go up to the browser URL box and change the page=2 portion to page=35 to jump straight to page 35. Hope you find these Twitter search commands useful. If you know of others, or would like to share your example uses, please leave a comment. If you are on Facebook and haven’t had the pleasure of reading a 25 Random Things About Me note about one of your friends yet, you are missing out. Normally not a fan of chain letters or tagging memes, I will admit the 25 Things activity on Facebook is fascinating. Facebook notes were launched on August 22, 2006, but didn’t receive heavy usage until 2009 thanks to a new viral phenomenon that started off as “25 Random Things About Me.” Memes using notes on Facebook are nothing new, entire websites have been put together to catalog and inspire various memes-most as lame as the emails that have been going around for over a decade. The earliest entries I can find via various search tools for 25 Things is mid-January. I really saw it taking off in my personal network starting in February. Using Google trends, I compared 25 Things searches to searches for an older site people might be familiar with: 43 Things. 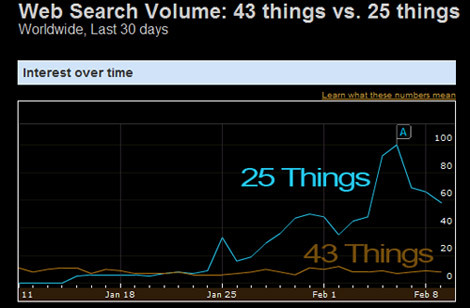 As you can tell from the chart, 25 things searches increased rapidly, easily overshadowing 43 Things despite the fact that users won’t find Facebook notes entries doing this search, nor will they find definitive information about the origins of it. 1. 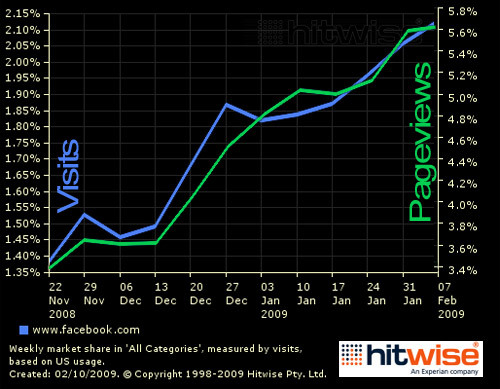 Login to Facebook and make sure you are on the main page (click Home if you are not sure). 4. Scroll down and you will likely see activity around 25 Things postings. 5. Click show more posts at the very bottom if you want to look for more postings. Patience is important in business. Facebook could have easily scrapped notes long ago due to low activity. I wrote a guest post over and IndieGoGo, a cool fund raising and awareness tool for filmmakers, on the topic of using SEO (and SEM) to attract an audience for your film. Making a film is a big enough challenge in itself, but if you are like most low-budget independent filmmakers, you’ll quickly discover that finding an audience for your film can be even more challenging. Outside of widely known marketing methods like submitting to festivals, inviting people to special screenings, and attempting to make friends on social networks, most filmmakers fail in allowing their audience find them on their own.